Color scrimshaw on ancient mammoth ivory by Matt Stothart. This leopard cub seems to have just discovered the power of his voice. Practice, practice, practice. Note the size of the paws. This boy will be a big cat when he grows into those paws. 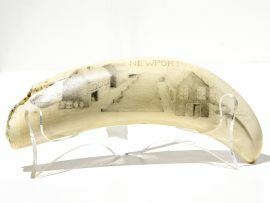 As usual, Stothart has done an excellent job on this nicely curved piece of mammoth ivory.